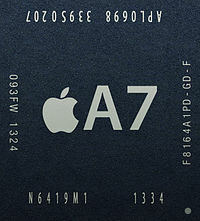 ↑ The real reasons Apple's 64-bit A7 chip makes sense (англ. ), Cnet (September 11, 2013). Проверено 3 декабря 2013. «the ARMv8 architecture itself brings some real advantages. One of them is a larger number of registers -- tiny on-chip storage areas where the processor stores data for very fast access. ARMv8 roughly doubles general-purpose registers from 16 to 31, which means the chip needn't fritter away as many cycles swapping things into and out of memory.». ↑ Yep, Apple's A7 looks twice as fast -- at least for fractal math (англ. ), Cnet (October 10, 2013). Проверено 3 декабря 2013. «There are two main reasons the 64-bit version tends to be much faster. First is that the number of hardware registers on the CPU is doubled, from 16 to 32. ... so the code runs much more efficiently. The second reason is that the 64-bit chip can perform two double-precision operations in parallel, whereas previous chips could only perform one at a time.». Эта страница в последний раз была отредактирована 8 мая 2018 в 06:42.